A start was made next morning, the 12th, and after bidding farewell to the townspeople, represented by Mr. Wheaton and Senior-constable Clarke, the snow-ball army stepped out for Mogriguy. A welcome waterhole just outside the town was availed of by a number of the recruits for a swim, and, thus refreshed, little time was lost in getting to the farm of Mr. J. H. Taylor, who was kindly leading the way through private property, and his own wheat crop, with the idea of cutting several miles off the regular track. When remonstrated with for permitting us to tread down his crop, Mr. Taylor said that he didn’t mind, it would bring him luck he remarked afterwards, when the rain came; that he was glad he had done so, as the ‘Coo-ees’ had brought the rain. 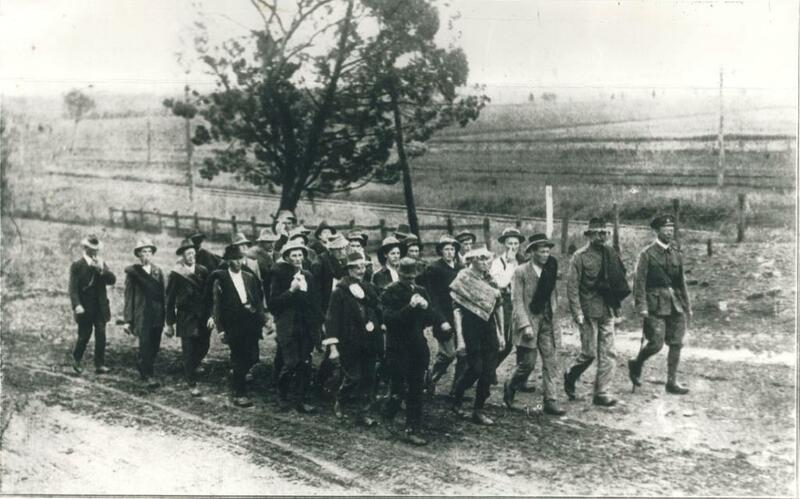 The heat had been intense since the commencement of the march from Gilgandra, and the dust and flies, a torment, but Tuesday morning broke cloudy with a westerly wind. Rain came after dinner before Mogriguy was reached, at five in the afternoon, where great preparations had been made for our reception. Owing to the generosity of the folk along the route, the transport waggon was proving inadequate, so arrangements were made for the purchase of an additional team and waggon in Dubbo. Meanwhile a conveyance was loaned as far as Mogriguy, and then another one provided to see the troops in to Dubbo. Mr. Taylor, perceiving the necessity for a light vehicle for the advance agent, has kindly lent a sulky and horse to go right through to Sydney. 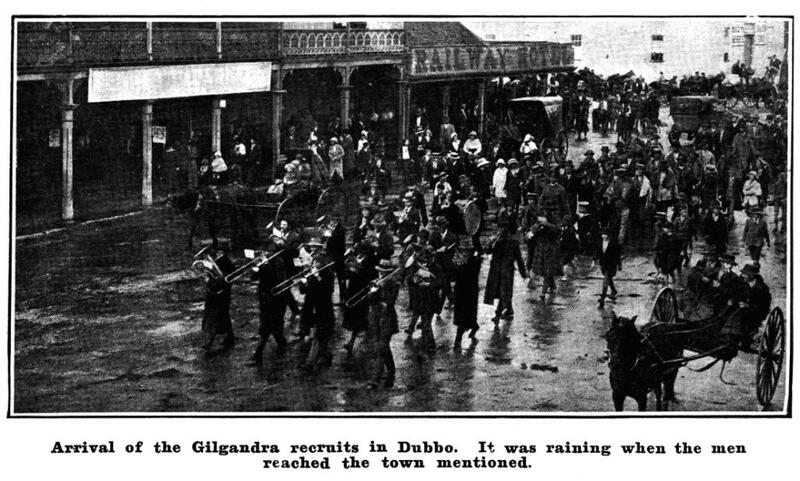 The rain did not damp the ardor of the Mogriguy residents; on the contrary, as the district is given over to wheat growing and the crops were badly in need of rain, every man, woman, and child trudged rejoicing and smiling through the rain and the sticky black soil mud to welcome the Gilgandra recruits. After a bath and an excellent tea, the troops were in good fettle to listen to Councillor Godwin’s words of welcome, and Mr. James Ritchie’s spirited remarks. Captain Nicholas, in responding on behalf of the men, said that he had been urgently requested by the young ladies present to extend leave of absence to the men so that they might enjoy the entertainment; that was to be provided after the supper; he was, however reluctantly compelled, in the interests of the men themselves, to refuse the necessary permission on the ground that a heavy march had just been concluded in oppressive heat, and the longest stage of the Gilgandra-Sydney route was that of the morrow, so that it was imperative that the men should have a good night’s rest. He said that he was beginning to think that the Turk would not kill the men, but that the Turkey might, and that before they had gone very far on the road to Sydney. The organiser of the great recruiting scheme, Mr. Hitchen, and Q.M. Sgt. Lee, also thanked the residents for their cordial welcome. 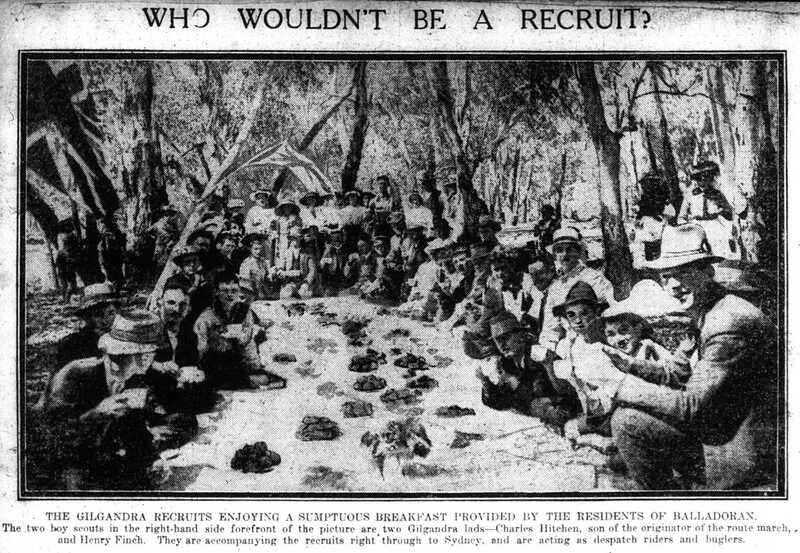 A quaint conceit in connection with the midday meal at Mogriguy was the labelling of the turkey luncheon table ‘Gallipoli,’ which the recruits were ordered to charge. When they had cleared the whole peninsula of the ‘Turks’ the British flag was hoisted to celebrate the achievement. Later in the evening an appeal was made for recruits to join the march, but no men were forthcoming. This was a pity, as Eumungerie [sic] is the first centre at which the appeal has failed to draw any response. The ‘Coo-ees’ moved out of Balladoran at half-past ten on Monday morning on the second day’s march, the Union Jack and the Australian flag leading and a company of school children acting as a guard of honor. Captain Nicholas, O.C., and Q.M.S. Lee responded, expressing the ‘Coo-ees’ ” gratitude to the Balladoran residents for their liberal hospitality. The men gave three cheers for the towns-people, then the schoolmaster led the children in singing the National Anthem, and cheers for the soldiers were lustily given to finish. After a good rest, some instruction in the elements of drill was given by the officer commanding, and a move was then made to Eumungerie, which was the location of the second night’s camp. This town was reached a little after five o’clock, and the boys were delighted to find that arrangements had been made for them to have a shower bath. They appreciated the thoughtfulness that put the ablutions earlier on the programme than the speech-making; and they enjoyed the speeches all the more for having clean skins. The dinner provided by the ladies of Eumungerie was an excellent one, and the boys, fresh from their bath, did full justice to it. Mr. J. Wheaton, chairman of the Eumungerie Recruiting Association, Mr. McLennan, vice-chairman, and Mr. McKeown, secretary, voiced the townspeople’s welcome, and Q.M.S. Lee, the ‘Coo-ees” official speechmaker, responded on behalf of his comrades. 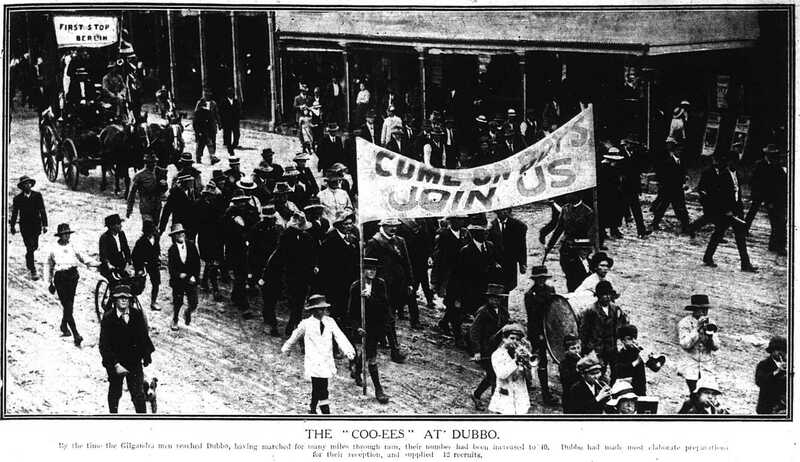 After dinner there was music and dancing, then when the crowd was at its biggest, Mr. Wheaton introduced Mr. McLachlan, the school inspector from Dubbo, and Mr. Blackett, who had driven from forty miles the other side of Dubbo, to meet the Gilgandra recruits. These gentlemen and Mr. Lee delivered rousing recruiting speeches, and two young men, S. Walker, of Balladoran, and H. Sharpe, of Eumungerie, announced their intention of being in the January contingent after harvest. When these men stepped up on the platform they were given a hearty cheer that must have strengthened their resolution to do their duty for King and country. An appeal for the Sheepskin Vest Fund found ready givers, and one local lady, Mrs. H. Griffith, gave £1 to the ‘Coo-ees” marching fund. Advantage was taken of the occasion by the townspeople to present one of the ‘Coo-ees’ that joined from Eumungerie with a wristlet watch to show their appreciation of his manliness and sense of duty in thus enlisting to take up his share of the burden. [This was Leslie Greenleaf]. The evening concluded with more dancing and the singing of several songs, but the majority of the ‘Coo-ees’ were glad to ‘sneak’ away to their blankets.